Back in early 2018, when I wrote about the Mount Gay Black Barrel rum, Ivar de Laat, one of the rum chums in Toronto, grumbled “I wish Mount Gay would be a little bolder. I find it all too friendly and not daring enough.” Were he to try this one — at the time he had not — he might possibly reconsider the first part of that statement….but not necessarily the second. Because the XO Cask Strength is equally friendly as its lesser proofed predecessor…and definitely bolder. Much bolder. And in that lies its attraction – that and its limited-edition premium cachet. 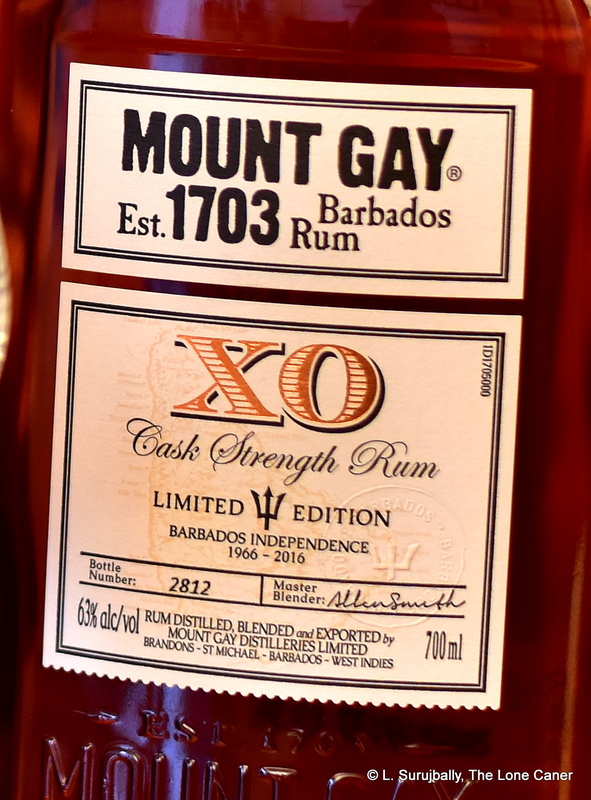 Though Mount Gay remains a major producer of quality Bajan rums and has a brand awareness quotient that’s pretty damned high (I named the standard XO one of the Key Rums of the World, remember), you get the sense that with the eyes of the rum world being dragged constantly to regard only Foursquare, it’s slipping in status. Well, maybe. My own feeling is that this nicely presented edition is an answer to those who want the XO hauled into the current world of limited, full proof juice without reinventing Barbados rums in any particular or fundamental way. You can’t fault the presentation or the stats (though you might balk at the price). The ovoid bottle is nicely labelled with the bottle number and Allen Smith’s signature, comes in a handsome wooden box with a small booklet in it that speaks to the rum. It doesn’t state the outturn on the label, but it’s 3000 bottles, a rum to mark fifty years of independence though itself it is not that old, being a blend of pot and column still rums aged between 8-15 years old (just like the regular XO, even if one gets the impression that certain select barrels were chosen here). And of course the main selling point, the 63% ABV, Mount Gay’s first serious foray into these strong and dangerous rum currents. Even ignoring the premium nature of it, the strength makes it a step up, because the entire profile is more powerful, more aggressive…much more solid. The assertive attack of the nose was a clear indicator that Mount Gay wanted to produce something to appeal to those who desired precisely that: it was hot and had a certain kind of fierce yet musky aroma redolent of a stable – dry, dusty hay, and leather. It developed further into caramel, nuts, almonds and dates and was very pleasantly deep and rich after opening up, with a fine line of bananas, peaches, light licorice, cognac and grapes lending a solid background to the smell, all really nicely done. That high-proof solidity of taste was also evident on the palate, though here some sharpness could not be avoided at 63%. Initial flavours of carmel and vanilla, blended with some light fruits (grapes, bananas, peaches) which lent some balance, but which faded oddly and quietly and rapidly away – surprising for something so strong. But as a consolation there were also notes of coconuts, licorice, burnt sugar, almonds, cumin, oak, eucalyptus, and something faintly minty, gone in a flash. Even the finish showed that some care and attention had been paid – it was long, dry, and left memories of hot and very strong black tea, caramel, oak, crushed almonds and vanilla. A very nice, solid rum – if I had to sum it up in the fewest possible words I’d say it’s a cranked up and better XO (which I tried alongside it, mostly out of curiosity). There’s nothing at all wrong with it – indeed, as noted above, it’s quite good – but conversely and paradoxically, nothing intensely exciting or exceptional about it either. Certainly it has somewhat of a longer and more muscular leopard’s tail in its trousers, but it twitches much the same. Because of the similarity in profile and naming, it’s almost impossible to get away from the inevitable comparison of the Cask Strength XO to the venerable and very well known standard version. The question is, I suppose, whether its worth five times as much, considering it’s “only” half again as strong, the profile is similar, the outturn is limited and the ageing is about the same (strip away the premium part and it may just be an undiluted XO). Still, I don’t think premium rums can or should be approached from this kind of coldly mathematical perspective, since any product’s value (and quality) diverges geometrically away from price the higher one goes. 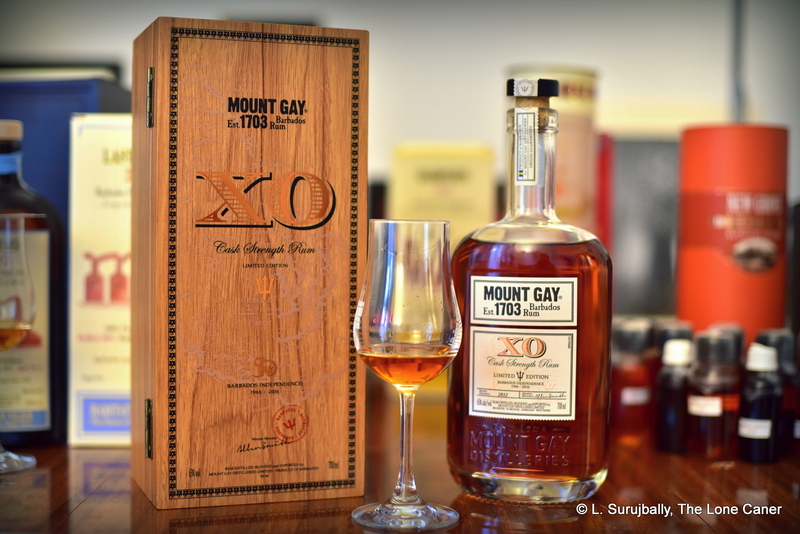 The Mount Gay XO Cask Strength is a perfectly serviceable rum, solid, sober, strong, traditional, tasty, totally in line with its forebears – it’s may be buying at least once, even at the price, just for that, especially if one is into the Bajan canon. But if you’re looking for “daring” as well as “bold,” you may have to wait a little longer before the company puts one like that out the door. This rum is only halfway there.